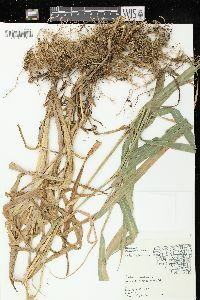 Plants perennial; not cespitose, rhizomatous, rhizomes scaly. 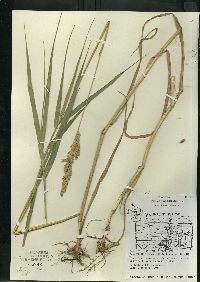 Culms 40-250 cm. 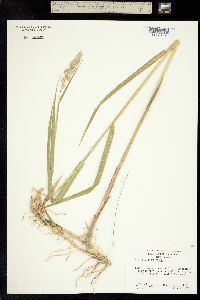 Ligules 4-10(11) mm, truncate, lacerate; blades 10-30 cm long, 5-20 mm wide, surfaces scabrous, margins serrate. 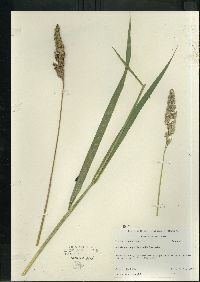 Panicles 5-40 cm long, 1-2 cm wide, elongate, often dense, always evidently branched at least near the base; branches to 9 cm, normally appressed but spreading during anthesis, the spikelets borne singly, not clustered. 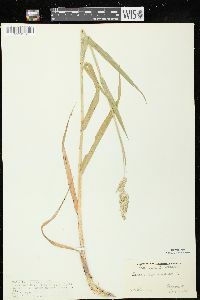 Spikelets homogamous, all spikelets with a bisexual floret; florets 3; disarticulation above the glumes and beneath the sterile florets. 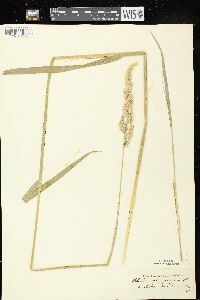 Glumes subequal, 4-8.1 mm long, 0.8-1 mm wide, keels smoothly curved, usually scabrous, not or narrowly winged distally, wings to 0.2 mm wide, lateral veins inconspicuous, apices acute; sterile florets 2, subequal to equal, 1.5-2 mm, less than 1/2 as long as the bisexual spikelets, pubescent; bisexual florets 2.5-4.2 mm; lemmas glabrate on the lower portion, pubescent distally and on the margins, dull yellow when immature, shiny gray-brown to brown at maturity, apices acute; anthers 2.5-3 mm. 2n = 27, 28, 29, 30, 31, 35. 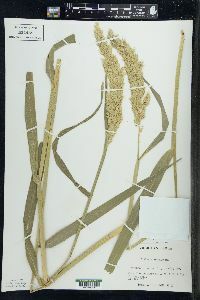 Phalaris arundinacea is a circumboreal species, native to north temperate regions; it occurs, as an introduction, in the Southern Hemisphere. 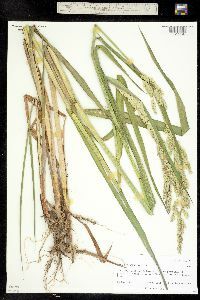 It grows in wet areas such as the edges of lakes, ponds, ditches, and creeks, often forming dense stands; in some areas it is a problematic weed. 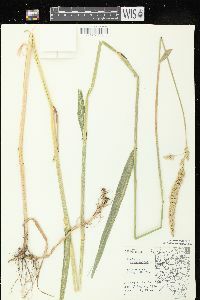 North American populations may be a mix of native strains, European strains, and agronomic cultivars (Merigliano and Lesica 1998). 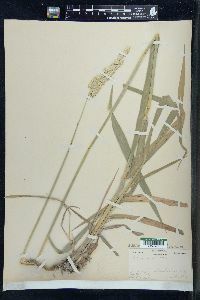 The interpretation adopted here is that of Baldini (1995), who treated Phalaris arundinacea sensu stricto as the most widespread species in a complex of three species. 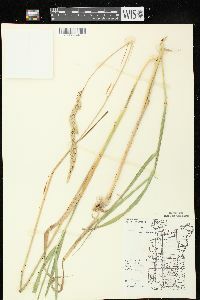 The other two species are P. rotgesii (Husn.) 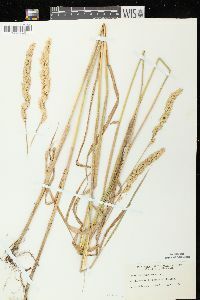 Baldini, a diploid that is restricted to France and Italy, and P. caesia Nees, a hexaploid that grows in southern Europe, western Asia, and eastern to southern Africa. 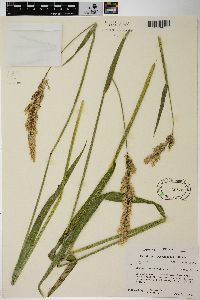 Phalaris rotgesii has glumes 2-3.8 mm long, sterile florets 1-1.5 mm long, bisexual florets 2-3 mm long, and anthers about 2 mm long. 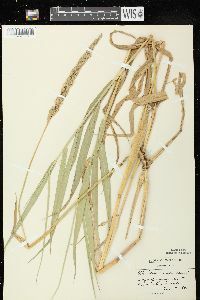 The corresponding measurements for P. caesia are 6-7 mm, about 2.5 mm, 4-5 mm, and 3.5-4 mm, respectively. 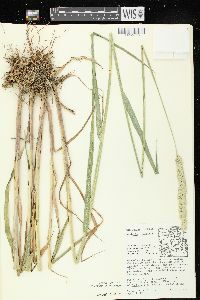 Other taxonomists have included P. rotgesii and P. caesia in P. arundinacea. 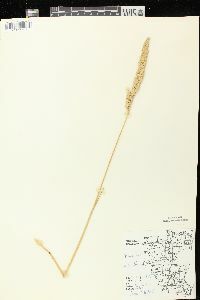 Only P. arundinacea sensu stricto has been found in North America. 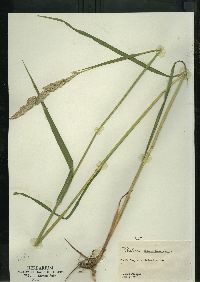 A sterile form of Phalaris arundinacea with striped leaves–Phalaris arundinacea var. 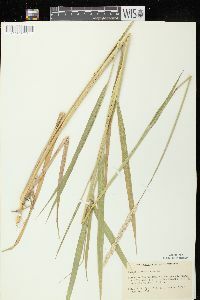 picta L., also referred to as Phalaris arundinacea forma variegata (Parnell) Druce–is known as 'Ribbon Grass' or 'Gardener's Gaiters' and is sometimes grown as an ornamental. 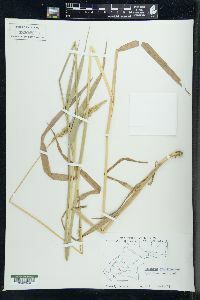 Baldini (1995) noted that it sometimes appears to escape, and is never found far from a cultivated stand. 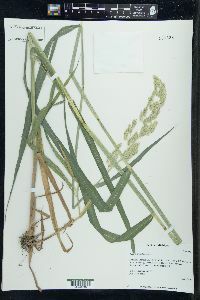 Phalaris arundinacea hybridizes with other species of Phalaris. 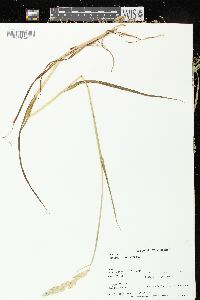 One hybrid, P. ×monspeliensis Daveau [= P. arundinacea × P. aquatica] is grown for forage. 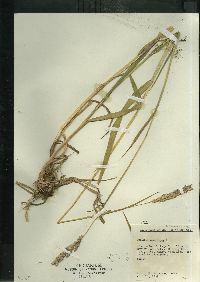 This species is infrequent in the lake area and local south of it. In most places in the lake area it seems to be a native while southward it is doubtless an escape. 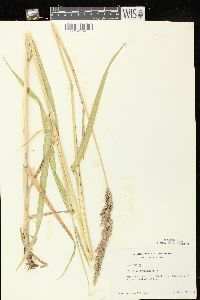 It is usually found in marshes but will thrive in almost any habitat. 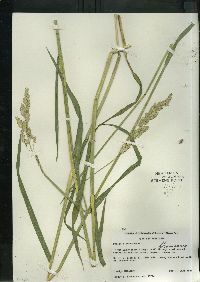 It is recommended as a fodder plant for low grounds, especially in the northwest. 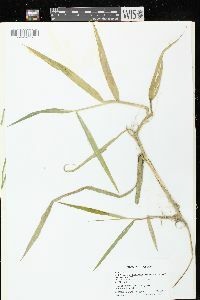 My observation and personal experience with it is that it is wise not to plant it if one wishes ever to get rid of it. 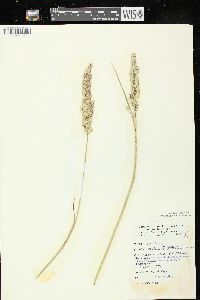 I have found it as difficult to exterminate as most pernicious weeds. 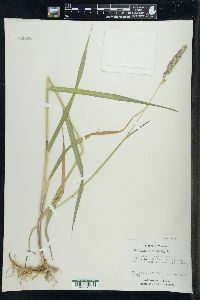 [Phalaris arundinacea also has] a variety [var. picta] with the leaves striped with white. 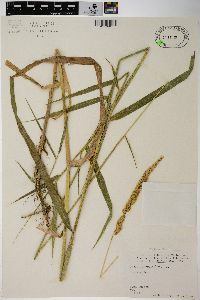 It is often used in cultivation and found as an escape in colonies along roadsides and in waste places. 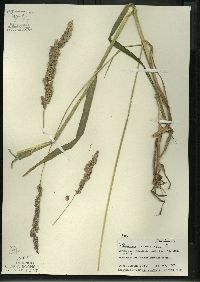 Colonial by rhizomes; culms stout, 7-15 dm; main blades usually 1-2 dm נ10-15(-20) mm; panicle 7-25+ cm, dense but branched or lobed, often lightly suffused with purple; glumes 4-6.5 mm, wingless, glabrous to scaberulous; sterile lemmas linear-subulate, evidently villous, 1-2 mm; fertile lemma 3-4.5 mm, appressed-hairy distally; 2n=14, 28, 35, 42. Streambanks, lake-shores, marshes, and moist ground; circumboreal, in Amer. from Nf. to Alas., s. to N.C., Kans., and Calif., more abundant westward. 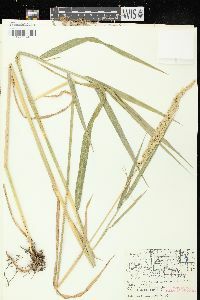 Ribbon-grass, with green- and white-striped lvs, is a horticultural variant.